Two victims of so called ‘humane’ animal agriculture are Amy and Joy, residents at Eden who died recently. Their lives began in tortured conditions which are regarded as ‘humane’ methods of food production in the eyes of most Irish people. ‘Humane’ animal agriculture is not designed to help those it exploits: it is a process that is motivated by profit in the context of an exploitative tradition. Eden Farm Animal Sanctuary features in an episode of Go Vegan Radio with Bob Linden where we discuss the harm of the humane myth. Furthermore, the psychology of ‘humane’ animal agriculture is one that soothes the prickles of conscience that are our only hope that people might consider the ethics of using other sentient beings as food and the vegan alternative. During the show I discuss my work at Eden, and the findings of my research into the ‘humane’ egg industry. 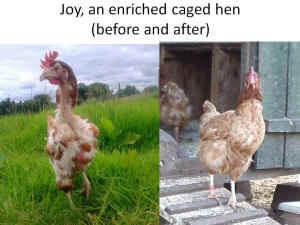 Please read "Enriched Cages and Embodied Prisons A Report on the EU Directive Banning Battery Cages for Egg Laying Hens" by Sandra Higgins, BSc (Hons) Psych, MSc Couns Psych, Director, Eden Farm Animal Sanctuary, Ireland - PDF. In death Amy and Joy continue to act as ambassadors not only for their species, but for animals everywhere who are seen as ‘food’. Please read Amy Had a Good Last Day and Enriched Cages and Embodied Prisons to learn more about Amy and Joy. Amy and Joy will be featured in Bob Linden’s forthcoming World Vegan Summit, scheduled for March 20-22 in Los Angeles, and organised to further the abolition of our use of other animals. For details on the Summit and how you can help, visit World Vegan Summit. The show also features an interview with Sherry Colb, Cornell University Law Professor, who discusses her book Mind if I Order the Cheeseburger? And Other Questions Vegans Get Asked. This book sounds very interesting and entertaining and is available from Amazon, Barnes & Noble, and Lantern Books. Gary Francione also speaks on the show about abolitionism versus reform of animal use, and Bob Linden draws attention to yet another diversionary tactic from veganism – the most obvious solution to the enormous contribution that animal agriculture makes to climate change. Grateful thanks to Bob Linden for inviting me on the show and giving me the chance to speak about the individual beings who are the 'Victims of Humane'.